To help these incredible and potentially dangerous individuals - and put the world at ease - the Garde have created an academy where they can train this new generation to control their powers and hopefully one day help mankind. But not everyone thinks that's the best use of their talents. And the teens may need to use their Legacies sooner than they ever imagined. Having recently read and enjoyed the Lorien Legacies series thanks to a rare bookish recommendation from my other half, I was thrilled to learn about the new spin-off series in the pipeline. Generation One is the first novel in this exciting new series and focuses on the events that take place after the final battle which closed the original series in United as One. I bought the book as a Christmas present for my partner then quickly snuck in to steal it and read it myself – once he had finished reading it, of course! Although Generation One is billed as a stand-alone novel, I do think that the prior experience and knowledge gained about the characters and the world they inhabit went a long way towards boosting my enjoyment of the book. Although many of the familiar faces pop up in Generation One, many of our main group of cast members are newly-introduced heroes and heroines, members of the ‘Earth Garde’. Fans of the original series will perhaps be disappointed to learn that there are very few appearances from the original Garde (with the exception of Nine and a flying visit from Four) although certain fan favourites do drop in from time to time. As the first book in this new series, it is understandable that a large chunk of the storyline is devoted to setting up the characters, the new world and environment, and outlining the basic story arc. However, this is achieved in such a way that it does not detract from the overall storyline of this individual book. Filled with plenty of fun, action and adventure, this is a fast-paced story that keeps up the suspense throughout the entire duration of the book and continues to keep up the interest from each page to the next. 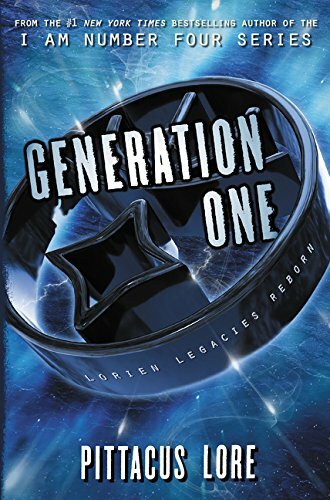 Ideal for fans of the original series and newcomers to the series alike, Generation One is a strong start to an exciting new Young Adult series! Generation One is available to buy now. Have you read the book? Did you enjoy the original series? Let me know in the comments below!